It was a very good year for the Beading Divas to the Rescue. Please read our donation history. Saffron, Diva Loren’s greyhound wishes everyone a good year. In December we raised $1,460.00 for Equine Voices Rescue & Sanctuary. 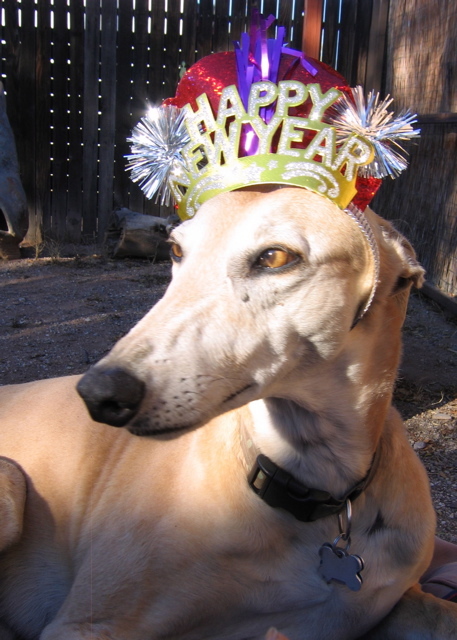 In January 2010, we’re going to raise money for Arizona Greyhound Rescue (AGR). The Phoenix Greyhound Park closed (YOWZA!) and many of those dogs are now racing at Tucson Greyhound Park. Tucson race dogs are being displaced for the Phoenix dogs. It’s a negative domino effect. AGR is picking up some of the slack. After January 3, bracelets will be for sale on Etsy and the link will be updated. Thanks to everyone who bought bracelets and helped animals in need. We are the Beading Divas to the Rescue: Angy, Cynthia, Glenda, Karyn (the blogger), Lizzie, Loren, and Michelle.